Today’s episode of Kumkum Bhagya starts with Prachi and her cousin noticing a person stealing their bags and follow him. The person calls someone and informs that he has the bags. He runs with the bags. Prachi tries to throw some wooden sticks on him but he succeeds in escaping with the bags. He enters Abhi’s award function. Prachi and her cousin try to follow him in the function but the guard doesn’t allow them to go inside. Prachi and her cousin tried to request him by diverting him for an interview. Girls grab the opportunity and enter inside. The guard informs the event manager about it. The manager instructs the guards to look for Prachi and her cousin. Award function starts. 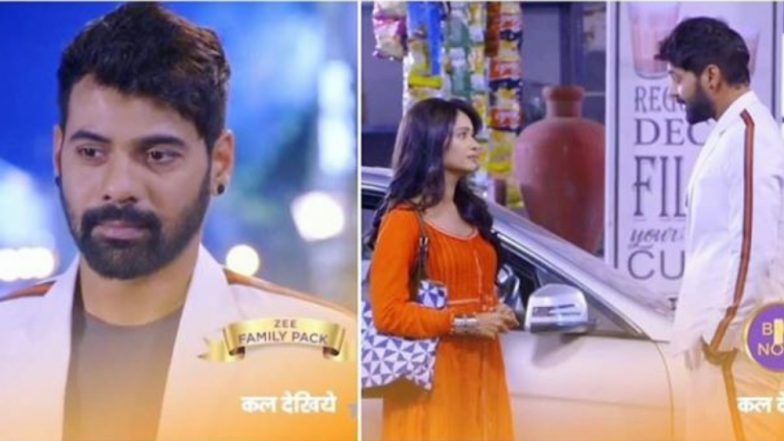 Kumkum Bhagya March 20, 2019 Written Update Full Episode: Pragya’s Worst Fears Come True When Prachi Bumps Into Abhi in Delhi! Mehra family keeps on praising Abhi (Shabir Ahluwalia) while they also attend the function. The host announces the award for Abhi but he is still waiting for Rhea. Meera asks him to receive the award as Rhea is on the way. But Abhi is in dilemma. Meera makes him understand that if he doesn’t receive the award, Rhea will feel guilty for it as he would not receive it because of her. Abhi receives the award. Prachi and her cousin are also right there in the function looking for the person who has stolen their bags. Prachi is impressed with Abhi’s speech who gives all the credit to his daughter. Abhi shares about his twin daughters. Prachi recollects what Bijee had told her about her father Abhi who separated twin sisters and threw away Pragya (Sriti Jha) out of his house. She wishes to have a father like Abhi. Abhi dedicates the award to Rhea and his other twin daughter but Prachi leaves from there before hearing that. Media clicks photos with Abhi holding the award with his family. Prachi and her cousin are very tensed as they haven’t got their bags yet. While they are looking for the person, guards catch them. He threatens them to send them to the police station. While they request the guards, Abhi sees them. A guard throws Prachi away but Abhi holds her giving a tough look at the guard. He asks whether she is fine. Abhi informs the guards that the girls came to meet him. Prachi and her cousin is shocked to see Abhi taking their side. He again asks her to think about her father before keeping herself in any problem. But Prachi says that her father is no more. She appreciates the way he cares for his daughter. Later he asks them to leave from there. But Prachi and her cousin are worried as they haven’t got their bags. By that time Rhea comes there. While she gets out from the car, the door of the car hits Prachi’s knee. Her cousin gets angry but Rhea goes straightway in the function calling them ‘Blind idiots’. Mehra family enjoys dinner after the award function is over. Rhea comes there. She apologizes for coming late. Abhi is happy to see her there. He shows her the award dedicating to her. Rhea feels very happy to see the award. Meetali says that she should have been there for the function as she missed his speech about her. Rhea knows that her father loves her a lot so he must have missed her while receiving the award.